We await a high-resolution version of the poster. Special thanks to @PaulChadkin on Twitter for posting the picture. UPDATE 1: 2 Easter eggs have been found in the poster. UPDATE 2: Disney/Pixar has released a higher resolution image. UPDATE 1: Pixar is known to hide Easter eggs in their films, but have we ever seen them hide some in their logos? As Pixar animator Chris Chua pointed out on Twitter, if you look closely (very closely), you will notice that there are two characters hidden in the logo. Go and look at the close-up. I’ll wait. The hidden characters are Princess Merida (Brave‘s main character) and her mother. It is a great touch to the Brave logo. Here I was thinking of how nice the Celtic-like lettering looked. Never did I see anything else there. Until now. Where will they hide Easter eggs next?! 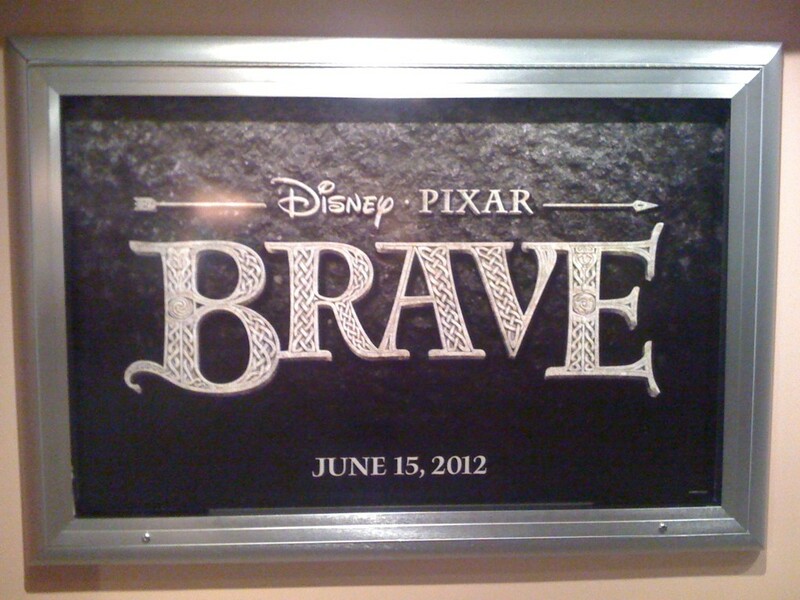 You can also become a fan of Brave on the brand new Facebook page for the film.